Six hardy Plodders met at Manchester Victoria Station on 'Wet, Windy Wednesday' at 10.30 am. Allan was last to arrive at the meeting spot due to losing his travel pass en route. Unfortunately whilst looking for it at the ticket barrier he dropped his phone and smashed the screen. Bad luck comes in threes they say, so we were quite relieved when the third was only the wind blowing away his rucksack rain cover which was not to be found. We then travelled by Metrolink to Stretford where we joined the Bridgewater Canal and started our walk towards the City Centre. We had to leave the canal just before Old Trafford as the towpath was closed to pedestrians. This was no problem as we walked through the industrial estate with the smell of baking bread coming from a Polish bakery. We then came to Sir Alex Ferguson Way and the Old Trafford football stadium - we didn't hang around there. Our next point of interest was the twin Skyhook sculptures commissioned by Brian Fell and unveiled in 1995 as part of the regeneration of Trafford Park Industrial Estate. We then were able to rejoin the towpath of the Bridgewater Canal as we walked near to the Pomona Docks on the Ship Canal. On arriving at the Cheshire Ring Canal we spotted a multi-coloured 'duck house' on the canal bank - I wonder which MP was claiming expenses for this city dwelling? After having lunch at the canal basin, sheltering under a bridge, we then got on the Rochdale Canal towpath under Oxford Road and towards the Gay Village where we cautiously walked along Canal Street to rejoin the Rochdale Canal. Shortly we came to where the Ashton Canal leaves the Rochdale at Ancoats and after having a look at Jutland Street (supposedly the steepest road in Manchester) we plodded towards the Etihad Stadium passing numerous new build apartments on the canal bank. When reaching Manchester City's stadium we left the canal down the sky blue painted Joe Mercer Way to Philips Park. On entering Philips Park we stopped for our final drink stop. The weather was now very kind to us as the sun began to shine and along with the wind dried us out very quickly. We walked through the park where we crossed the River Medlock towards Philips Park Cemetery and I related the story from the Manchester Courier of 15th July 1872 when a flood came and the banks of the River Medlock overflowed to such an alarming extent that the flood increased in depth and power over a large portion of ground appointed to Roman Catholics, not only carrying away tombstones but actually washing out of their graves, a large number of dead bodies. Those watching could easily see that the bodies had been disinterred and were floating down the river. It is impossible to calculate how many had been swept out of their final resting place but the number is not short of fifty. We then walked past the Jewish Cemetery and then left the park to walk a short while on tarmac to rejoin the Rochdale Canal and walk back on the tow path to the City centre and onwards to Manchester Victoria and our journey home. In comparison to the rest of the country the weather was relatively kind to us and by the way, the good news was, Allan returned to Wigan Wallgate Station where he was reunited with his lost travel pass. Lancashire Monastic Way. Wednesday February 5th. Well, I tried, I really did. An e-mail was sent round warning of the muddy ground conditions on this walk. I advised people at the club meeting that conditions were bad underfoot and that it was a terrible weather forecast. The forecast on TV the night before issued all sorts of weather warnings. Despite all this, 20 people and one dog (well, she didn’t get a choice!) turned up to walk the third leg of the Lancashire Monastic Way. Certifiably mad? Maybe. Colin drove up from Telford again and we were joined by Bonnie and Clive from Glossop. In the end the weather wasn’t too bad considering the forecast and parts of the route were drier underfoot than on the recce. After parking behind St Mary the Virgin Church in Rufford we admired the base of a preaching cross dated 1000AD and then joined the canal. Passing Rufford Old Hall we followed the canal to Sollom lock where we left June and Barbara waiting for a latecomer (no names no pack drill, but maybe he had stopped for a bacon butty?) After a short stretch on the river Douglas we made our way to the closed chapel of St Mary in Tarleton where morning coffee was taken; giving the others a chance to catch up with the group. The churchyard here is a credit to someone/some people, a really well kept place. Walking along the A59 we passed a restored Windmill and looked at Carr House. This was the place where Jeremiah Horrocks viewed the first recorded Transit of Venus in 1639. Crossing the busy road we sauntered along a country lane to St Michael’s Church where Jeremiah was the curate. A quick admiring look and then off across some fields to soon re-join the Douglas along a raised banking. The wind was certainly fresher here but it was at our backs. John had a muddy encounter when he slipped from a stile and painted his back a lovely shade of brown. On reaching the beginning of the Ribble Way we turned onto the road, glanced at the Dolphin Inn (start point for the next leg) and began the trek back to Rufford. June and I had planned a lunch stop on some exposed fallen logs but the wind was strengthening and there was some rain in the air. We spotted some builders storage sheds and they served very nicely for a dry sheltered lunch. Barbara tried to brush some mud off John. Suitably refreshed we tackled the many sodden fields that were a great feature of the return journey. Norman had brought a flag with him to let any British Soldiers on this Somme encounter know that we were on their side! Repelling all Germans we eventually reached Bretherton where we took a welcome breather in the shelter of the church. I had bought some chocolates and they were gratefully accepted; a good sugar rush after the hard work of the mud. After passing the Old Bretherton school there were a few more fields before reaching the River Douglas again ready for the final push to Rufford. Although the ground was drier here, the wind was in our faces so it was hard walking. Never mind, we were back in Rufford for 4pm. 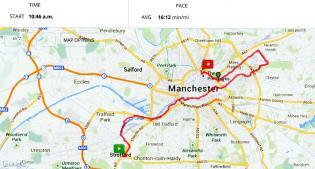 Although I had tracklogged the route at 15.3 miles, the GPS readings were at 16.8 miles. Ooops! Well, never let it be said that East Lancs don’t give value for money! Lots of “Thank you’s” were said to us and we must thank Norman for back-marking so ably. I’m looking forward to seeing all you mad people on the next leg. NB. There was an inscription on the Tower of St Michaels' Church. "Sine Sole Sileo". Barbara has looked it up and it means "Without the sun I fall Silent". We may not have had the sun but we were definetely not silent! This is the third Face in the Rock walk. The previous two saw excellent weather although last year it didn’t look promising at the start, it turned out to be a great day. Once again we had a great day weather-wise, although understandably it was rather wet under foot which bought the usual penalty of lost points. I think I gained a few points for the piglets we saw near Higher Spen Farm though. 18 walkers with 2 dogs left promptly at 09:00hrs. (with all the gadget guys and gals setting their GPS’s) and arrived back at Foulridge about 16:30. There were visitors from other groups as well as a couple of non-LDWA guests. Once again we heard the story of Buttercup the cow falling into the Leeds/Liverpool canal, the haunting of Hob Stones Farm, John Wesley’s incident in Barrowford, some info relating to the witches of Pendle and of course a search for the “Face in the Rock” for the ones who hadn’t done the walk previously. The walk starts by the canal at Foulridge, near to one end of the “mile tunnel”, but we left the canal almost immediately and headed for Lower Foulridge Reservoir before following a disused railway track to the other end of “mile tunnel”. After arriving in Barrowford, we started the first climb of the day of about 500ft with excellent views all round, and in particular to Pendle Hill as we climbed higher. Then we descended slightly to pass Bull Hole Farm before the next climb of 200ft to the coffee stop. After the break we walked along the lane to Newchurch-in-Pendle before starting the next little climb (only 150ft but feels like more) then all downhill to Barley and lunch. After lunch we looked like we were going straight up Pendle Hill, but we only went part way (approx. 500ft) before dropping to Salt Pie Farm. We followed the track around Upper Black Moss reservoir, then up to Stang Top Road. After crossing the road, the walk is gently undulating with views to Stansfield Tower which we pass close to later. Before that we drop to where Pendle Water is joined by Blacko Water and then a short climb up to Blacko and on to just below Stansfield Tower, also known as Blacko Tower. After more undulations, we reached Whitemoor Road and the descent to the Leeds/Liverpool Canal with just a short walk back to the car park. Thanks to everybody who came, and Mark for the photos. Note the gallery photos are being reduced in size more than they should. I wil refer this bug to National Webmasters.